THE ART OF GAMING. ((( a blog mainly about board-, miniature-, roleplaying games & comics. ))): thud. 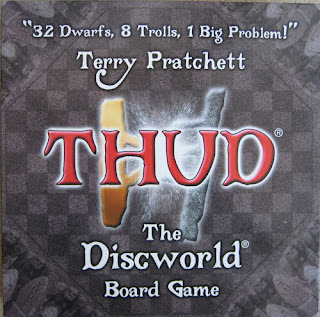 Thud is a boardgame based on the great Discworld novels written by Terry Pratchett and brings the famous battles between dwarfs and trolls to your home. The game (in Dwarfish called "Hnaflbaflwhiflsnifltafl") represents the famous Battle of Koom Valley - especially in the book "Thud!" this battle is mentioned. The components of "Thud" are really striking. Not only the board itself, but especially the 32 dwarfs and the 8 trolls are of high quality and look stunning. 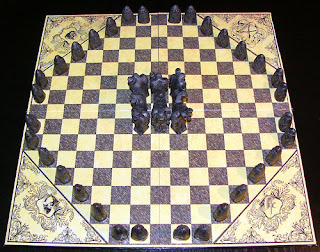 In the middle of the board a thudstone is placed, and around it you put the 8 trolls. The dwarfs start at the outer fields of the board. The dwarfs can move (like a chess queen) or hurl (to destroy a troll), whereas the trolls can move (like a chess king) or shove (to capture dwarfs). The players alternately move and try to destroy each other, at the end all the remaining miniatures are summed up (a dwarf counts 1 and a troll counts 4) showing the final score. As the two factions have very different skills, it is recommended to always play two games - and change sides in between. The game is really fun to play, especially when you have read some of the Discworld novels. And even if the game sometimes felt a little bit unbalanced for me, it's still okay as you have to change sides and play again. Depending on which side you play you have to think about a proper strategy, of course not to forget to adapt it during play as your opponent will for sure act differently than you expected. THUD - Discworld Board Game is based on a battle between Dwarfs and Trolls. Players take turns leading each side in an attempt to defeat their opponent, but to win you must utilise very different tactics with each race! The fast moving Dwarfs must form up into blocks as quickly as possible, before hurling their crazed axe-wielding comrades at the Trolls. The slower more ponderous Trolls must catch and squish these whirling axe dervishes before they have a chance to properly organise. 32 Dwarfs, 8 Trolls, 1 Big Problem !! !